Have you taken in one of our seminars yet? We have one coming up at the fascinating National Maritime Museum (in case you missed the announcement), and in the article below, you can get a sense of how we do these things. Don't miss out! This was the second seminar that the NHIG has staged and included presentations and practical demonstrations with ample opportunities for the delegates to discuss the issues raised. Delegates from north, south, east and west attended, representing conservationists, architects and practitioners. The day was introduced by the Chairman of the NHIG David James who then proceeded to give us all an overview on how lead has historically been used in ironwork, for example as a fixing method, filler, component in coatings, cast decorative detailing or as a backing when doing repousse. Particular attention was paid to advising on health and environmental considerations, which are essential when working with this material, and this raised important issues. Andy Thearle then did a presentation on lead casting and making lead moulds. He showed a series of slides of traditional 18th/19th century ironwork with lead cast details, which are very commonly used in the city of Bath. The lead casting decorations were fascinating in that it is easy to mistake many of them for cast iron. Andy also brought a wide variety of different sample castings and moulds for the delegates to examine. 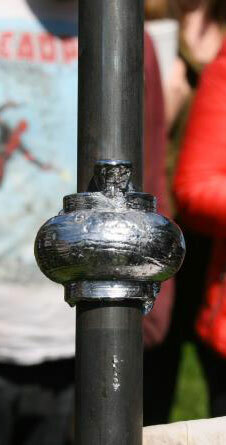 The use of relatively cheap reproduction moulding techniques were discussed followed by a practical demonstration of casting a lead ball detail around a bar. It was particularly interesting to see how much detail could be achieved relatively quickly. Brian Hall's presentation on lead sculpture was very interesting as it is a subject on which many of us had little experience. Lead sculpture became popular in the late 17th and early 18th centuries, and Brian took us through some case studies including one of the repair of a statue of Charles II on horseback and the major limb surgery carried out to give this magnificent beast (the horse!) a new lease of life. Just coping with the weight of these objects demands significant thought and preparation. Brian and David came together to discuss lead fixing and the removal of lead fixing from stonework - the definite message here being if you can avoid having to remove it, then don't. 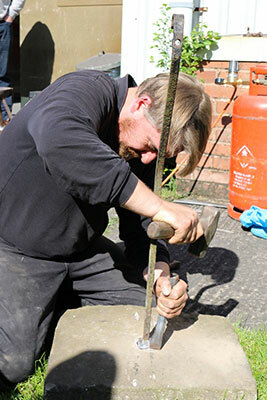 Paul Ashmore gave a practical demonstration of the removal and fixing of iron in stone with lead. This proved to be of great interest drawing the crowd of practitioners and advisors around with a wealth of advice, wisdom and laughter to help Paul cope with removing a really recalcitrant fixing (I'm sure Paul really appreciated the input!!). 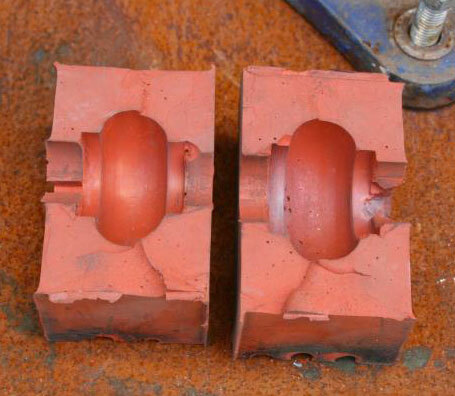 It amply demonstrated the significant effort and time it can take to remove existing fixings. This was followed by Paul giving a practical demonstration of leading in. The day came to a close with some delegates saying that they had very long journeys home but the event had been well worth the drive. The glorious weather, good food, the chance to meet new people and the opportunity to gain new insights made it a great day for all concerned. --- Thanks for coming!! A big, big thank you to Herefordshire and Ludlow College for hosting us at the Rural Crafts Centre and allowing us to use their excellent facility, and thank you also to Supply UK hire shop for the loan of a diamond drill and core bits. Organised in association with the British Artist Blacksmiths Association (BABA) and the Institute of Conservation (Icon) the event is aimed at heritage professionals, practitioners and the general public, BathIRON represents a unique opportunity to engage in something truly spectacular. Talks and presentations will cover a wide range of conservation and restoration topics, encompassing techniques, methods and materials, as well as ethical and contractual issues, with papers being invited from diverse groups to stimulate active discussion. A good mix of introductory and in-depth sessions will ensure that both new-comers and old-hands are catered for. The focal point of this unique event will be the live creation of a brand new balustrade for the bandstand in Parade Gardens. Designed and crafted by Master Blacksmiths, the balustrade will be forged in the fire in the traditional manner over the four days, culminating in a striking piece of public artwork befitting its majestic surroundings. There will be live music, exhibitions, street food, opportunities to try your hand at forging, pop-up forging around the city and general fun! More details to follow, mark your calendar and watch this space! The ICOM-CC Metals Working Group and the Indira Gandhi National Centre for the Arts are pleased to announce the call for papers for the 9th meeting of the Metals Working Group. This is the first time that the conference will be held in South Asia, an historic occasion for the Group and an event not to be missed. The Traditional Paint Forum announces that, after the sell-out success of last year’s annual conference, they will be staging a two-day conference on 30th September to 1st October 2016 at the Black Country Living Museum. They will be addressing issues of conserving and preserving historic metalwork, be it architectural or industrial, which are often complex and fraught with problems. They will be looking at these issues through the prism of industrial and transport heritage; its history, conservation, repair and restoration. Reminder - Heritage Lottery Fund's "Skills for the Future" is back! The Chair, Sir Peter Luff, recently announced a third round of their Skills for the Future grant programme; and in the Culture White Paper published in April they confirmed their commitment to invest £10million across the UK. Skills for the Future offers paid opportunities to develop skills that will equip people for a career in heritage, with grants from £100,000 to £750,000. There is a focus on meeting skills shortages and increasing the diversity of the heritage workforce. Guidance and forms on their website. It is a two-round application process, with 29 September the deadline for first round applications. One of the West Dean Building Conservation Masterclasses, this course covers the conservation of structural metalwork, architectural features and statuary, and includes both ferrous and non-ferrous metals, with tuition from leading practitioners on a wide range of repair techniques. It also includes the methods of manufacture and shaping of ferrous metals, the history of their use, deterioration, surveys, practical cleaning methods, surface preparation and coatings, and specifying metalwork repairs. It covers corrosion science, the latest developments in cathodic protection as a remedial solution to rusting cramps and the science of traditional electrotype forming as used for statuary. 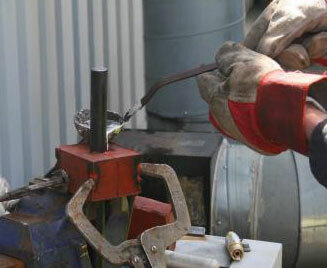 There will be a ‘hands-on’ opportunity in the Forge when students will be able to try out traditional and modern techniques relevant to architectural conservation such as forging at the hearth, arc and gas welding, flame cutting and needle gunning. The Society for the Preservation of Ancient Buildings (SPAB) runs a Maintenance Cooperative Project specifically aimed at those involved in conserving ancient church buildings. Creating a series of locally-based networks – local Maintenance Co-operatives - to share good maintenance practice and help the people responsible for places of worship to take good care of their buildings. Providing free extra training for churchwardens, fabric officers, property stewards and other volunteers responsible for the care of places of worship to the point where they can confidently look after day-to-day maintenance issues themselves. Supporting the recruitment of new volunteers to help look after historic places of worship. Sharing good maintenance practice with the wider community –both locally and nationally." Cathedral Communication's website has an excellent article on wrought iron - you can never have too many of these! We have decided we will allow ads in this newsletter, subject to a few guidelines. Ads cost £50 per issue, but there can be exceptions at the discretion of the Editor if the ad is deemed to be in the specific interest and well-being of NHIG's cause - for instance, a forum held by another group on ironwork conservation. If you want the complete policy document, or want to place an ad, please email the editor with your request. Support NHIG - Become a Member Today! NHIG invites you to support the charity by becoming a member. For full details please visit the Support Us page of our website. Many thanks for your continued interest. Please do forward this message (via the link at the bottom of the page) on to anyone you know who may be interested in supporting the NHIG and ask them to contact us so I can add them to our mailing list. Copyright © 2016 National Heritage Ironwork Group, All rights reserved.